Well for anyone who has grown up or lived in Adelaide, you will be aware of the annual Christmas Pagaent. This is the day of days for any child in Adelaide and marks the beginning of the Christmas season where Father Christmas comes to the city. I am running late, and didn't get a chance to post this before hand. I do have some great tips as a regular Pagaent goer. This year the weather was absolutely perfect. We weren't planning on it, but we arrived earlier - everyone in the house was up - so I figured we might as well head in. We had food, drinks, rugs, cushions, and chalk. With 4 children I need to be prepared to ensure it runs smoothly and is enjoyed by all. We are fortunate that Mr S works in the CBD and is able to access his building after hours. So we camped out the front of his building, which meant he could easily run the children up to the toilets as required. DD#2 had made some biscuits on the Friday before hand, and we took in popcorn and fruit boxes. We arrived at 7am when the roads were closed. 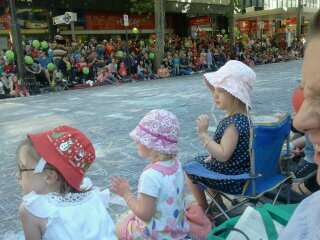 Armed with chalk, the children started drawing and entertaining themselves. We secured front road seats. We were mainly in the shade, which is also important when waiting in through to the end at 11:30 and being of Irish decent we are all as fair as fair. It was a great day. DS #2 (baby #4) learnt to wave which was my highlight of the day. But it was also great to see DD #2 (baby #3) was so enlighted and enchanted by the magical floats and clowns.You can see how thick the crowd is and all the chalk drawings on the road. It is a great day and is FREE - so for a family with 4 children is a great event without spending any $$$$. Thanks to the Pagaent Sponsors, the Credit Unions www.cupageant.com.au. This year was the pagaent's 80th year and it was great to see new floats and lots of new and fresh costumes about.